You can click on any blue words in this article to find out more about it, or to be led to that recommended product. As a pet in captivity, Sugar Gliders don't have the opportunity to engage in the activities that they naturally would in the wild. Mammal behaviorists who have spent time observing gliders in the wild have reported that playtime ranks second only to food gathering in priority. Playtime helps to foster better mental health and a sense of independence. 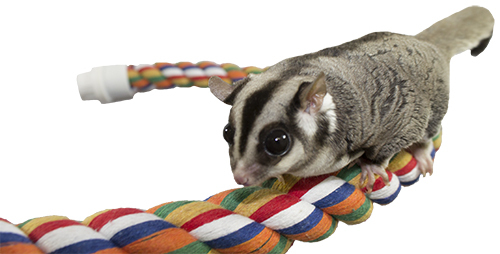 In young gliders, playtime is part of the natural learning process in which young gliders start to learn about textures and shapes. Toys help in development of coordination and dexterity. Exposure to a large variety of objects at a young age helps to create a more confident, less fearful glider. Toys provide an outlet to expend energy through exercise. Instead of directing aggression towards their owners, they can instead direct their aggressions toward the toy by dangling, swinging and chewing. Add 2-3 toys to your glider's cage and watch the action! WOOD: Safe Woods (not a complete list): Pine, Balsa, Birch, Basswood, Poplar, Maple, Walnut, Ash, Apple, Elm, Cactus (Cholla) and Manzanita. Unsafe Woods (not a complete list): Cedar, Red Cherry, Plywood, Oak. If you like to make your own toys, NEVER use pressure treated wood. It is treated with arsenic and will poison your pet. If using natural branches make sure they have not been exposed to insecticides. Also, take care to collect branches in areas removed from highways where plant life may have absorbed toxic emissions from cars. Scrub all branches with a non-toxic disinfectant (dilute chlorine bleach), rinse and dry thoroughly. If you need to clean wood toys, don't soak them. It is best to wipe them clean with a damp cloth or sand the soiled area until clean. If your glider likes to dunk his toys beware that moisture can promote bacterial growth and the toys should either be discarded or thoroughly cleaned and dried in a low temperature oven before returning them to the Glider. ROPE: Several kinds of rope are used in glider toys. Only 100% natural fiber ropes such as cotton, hemp (jute), or sisal should be used in glider toys. Nylon blend ropes should never be used as they can result in serious injury and cuts due to the strength of the strands if the pets get caught in it. Ropes can be safe as long as they are maintained properly, and the glider's nails are kept trim. There have been safety problems noted when excessive fraying occurs. Gliders have lost circulation to legs by getting tangled in ill maintained ropes. Glider owners have a responsibility to check their pet's rope toys daily and to cut back or discard rope toys when they become frayed and present a hazard to their glider. 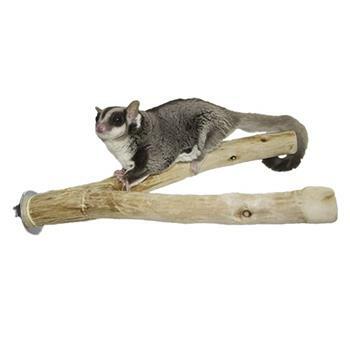 A glider's nails can be trimmed using Safari Nail Trimmers, and then kept filed using Sandy Tracks and Sandy Branches. Stefan Hattingh, a wildlife carer and ecologist living in Australia, says "I’ve been involved with wildlife rehabilitation for almost 15 years. I built the glider gym as part of a release program to improve the survival rate of orphaned sugar gliders. The 7m long enclosure has nest boxes, ropes and pulleys, and logs with hollows.". Read more about Mr. Hattingh's project here. PLASTICS: Acrylics are used in many toys today and, if sized properly to the glider, are virtually indestructible. If purchasing acrylic toys we recommend the acrylic have a minimum thickness of 3/16". We recommend that a few of your glider's toys be acrylic or a blend of acrylic and wood. They will be long lasting and the bright colors used are stimulating to your glider. RINGS: When choosing toys with rings or large plastic chain links, make sure that the rings are of a size that the glider can’t get his head stuck in them or choke. Also beware of toys with multiple rings looped directly together as gliders have met similar fates when they have been trapped between the rings. BELLS: Gliders love to make noise and bells provide a fun source for their merry making. If a glider is mechanically inclined and can remove the clapper the potential exists for swallowing/choking. Make sure the bell clapper can not be removed by the glider. If it is not securely fastened either remove it or weld it (we recommend silver solder). Make sure the clapper is not lead (toxic), if it is lead you will be able to dent the clapper with your fingernail. Do not buy toys that use jingle type bells, toes can become caught and cut in the wide to narrow openings, we recommend the cow or liberty bell design. FINAL CONSIDERATIONS: Just because the label says the product is safe doesn’t mean that it’s OK for your glider. Any toy has the potential to be unsafe if improperly sized to the glider. As with kids, no toy is 100% safe. 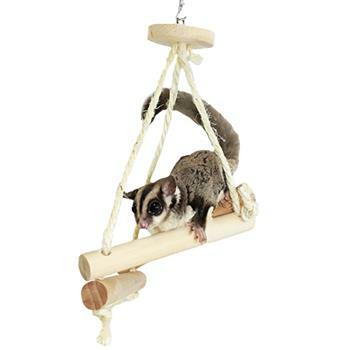 Use common sense and supervise your gliders when you first give them a new toy. Observe how they interact with the toy to determine how best to hang it and where and when to allow them to play with it (some toys are safer outside the cage). 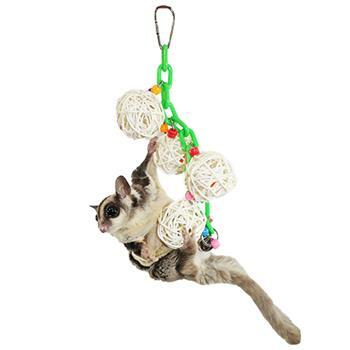 Provide a wide variety of toys and rotate them in and out of the cage or play area. Variety will help alleviate boredom and keep your glider more alert and curious. Keep 2-3 toys minimum in the glider's cage and don’t overstuff the cage so the glider doesn’t have room to climb and glide. Don’t assume that if your glider doesn’t like a toy that it won’t play with any toy. Try something different and take the time to observe what your glider finds interesting in terms of design, texture, or size.